The Hilton Head Island hotel Main Street Inn is located on the north side of Hilton Head Island South Carolina. 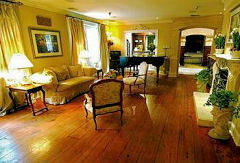 I wanted to find out why this bed and breakfast was selected as one of the "Best Kept" secrets on the island. 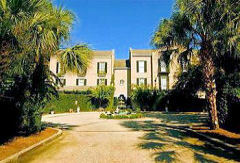 The Main Street Inn Hilton Head is very nice and there is a formal garden and beautiful exterior landscaping. When you first arrive it seems as though you have entered a secluded paradise and for me it did not have the warmth that I was expecting. The formality extends beyond just the courtyard. Hotels in Hilton Head Island cant get any different than this inn. There is a definite European feel to the Main Street Inn Hilton Head that is reflected in the lobby and throughout the property. 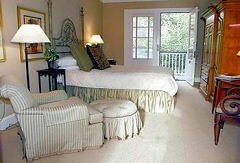 The furnishings and linens all have an Old World charm that is quite elegant especially for Hilton Head SC hotels. The duvets for the beds are made from velvet and trimmed with silk brocade. This enhances the overall look of the room but it also made it seem more like a museum and less like an inviting place to spend the night. I thought that many of the details in my room were very tasteful and refined, but again did not have a welcoming quality like most hotels in Hilton Head Island. All rooms come equipped with a refrigerator and ice maker. We did not use the refrigerator very often, but we were constantly using the ice maker. 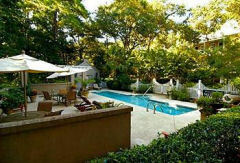 Like most hotels in Hilton Head Island you can bask in the sun or go swimming. If you want to choose something a little more exhilarating you can play golf or make reservations for horseback riding. I went shopping and enjoyed visiting some of the local restaurants on Hilton Head Island South Carolina. The Main Street Inn Hilton Head can seem almost too quiet on occasion and I really liked being able to be out in the noisy, bustling town. When I would return to my room I could then appreciate the tranquil atmosphere of this Hilton Head Island hotel. I was accompanied by my sister on this Hilton Head vacation, and for the two of us this was a nice, but not outstanding getaway. The Main Street Inn Hilton Head would be a good choice for couples or individuals who enjoy seclusion and want a relaxing and tranquil getaway. Hilton Head SC hotels cant get any more quite than this one. Even though there are childrens activities available I would not recommend the Main Street Inn Hilton Head for families. Kids want to touch things and explore and this is one of those places where you would have to restrict that curiosity. This would defeat the idea and reason behind a fun family vacation and in my opinion there are better hotels in Hilton Head Island for families. 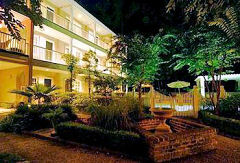 So if you want a Hilton Head Island hotel with quiet, peaceful atmosphere this inn is the right choice.